We all know that late winter is a time of year when our social life can drag. If you’re getting tired of all the same routines, or itching to get out of the city altogether, try spending a day at the Red Sea in Ain Sokhna, where you can escape city life and enjoy a day of nautical adventure on a rented yacht. It’s sure to spice things up during the dull months. Yacht rental is available year round, but the end of winter-early spring time is the perfect season for a mini sailing excursion. So pack your sunblock and prepare for the ideal getaway as we get you out of the city and into the sea in a matter of hours. With prices starting at 800LE and going up to 2,000LE, you might even be able to have fun without burning a hole in your pocket. The yachts come in a variety of sizes, with passenger capacity depending on which size you commission. The boat leaves from Dome Marina across from Porto-Sokhna, at 800LE for a maximum of ten people. For a whole day you can cruise the waters, take in a little sun, inhale clean air, or spend the day getting a deep-golden tan. If you’re brave enough you can even swim in the chillier months. These are by no means high-speed boats, and don’t expect a hip-hop video yacht that gleams in the sun with mahogany and chrome. But they are roomy and relatively clean, aside from the bathrooms, which should be avoided if possible and are not particularly female friendly. So kick back and enjoy a leisurely sail through the waters as you bask on the decks of the somewhat aging craft. All yachts for rent have front and back decks, a small indoor cabin as well as an upper level where the boat captain sits. While we saw no dolphins, apparently some lucky boaters do catch up-close glimpses as they jump out of the sea alongside the vessel. 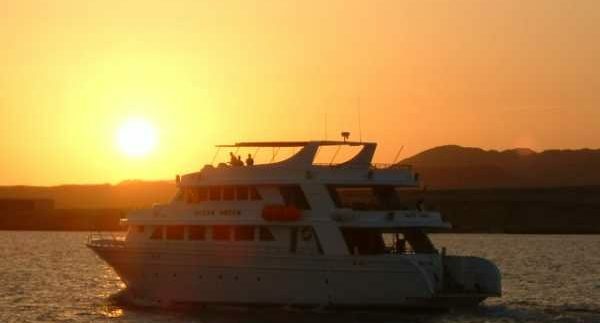 The boat is yours from six am to six pm, designed to best capture sunrise and sunset with a spectacular panoramic view. But don’t worry, the timings are up to you—we certainly did not make it out at dawn. If you are one of those ambitious early risers you can drive from Cairo to catch your morning boat or stay the night somewhere in Ain Sokhna to make getting up early a little easier. If you don’t have access to a house, there are a range of hotels available – Stella Del Mare comes the most recommended. Being out in the open fresh sea air can make you hungry, so choose between being served a freshly-caught seafood meal on board by the crew or stocking up and bringing your own munchies. The meal is whatever is caught at the moment, served with rice and vegetables by the captain. If you are an avid fisher you can cast lines off the back of the boat – serious fisherman may want to bring their own gear—and the crew is known for doing some lure fishing part way through the trip, so be prepared for some flopping around on the back deck. So get ready for your own private party! Blast music, play cards, eat, drink, stage a photo shoot, or drop anchor and dive off the edge. The boat does have a speaker system but I doubt it’s iPod friendly; we brought our own portable speakers and set them up on the front deck. When the captain is DJ it’s pretty much all Arabic music, all the time – which is great if you’re a fan, but a warning to those who prefer their own playlists. In short, this day trip is a perfect and very inexpensive mini-getaway. Relax and take in the fresh air, water and sun and some completely chilled out time with your friends while you cruise the Sokhna coast-line, dropping anchor wherever you or your captain desire. Travel Tip: To make a reservation or inquire about the options call: 0122440198. Even if you’ve already booked your boat, I would recommend confirming your reservation the night before departing.